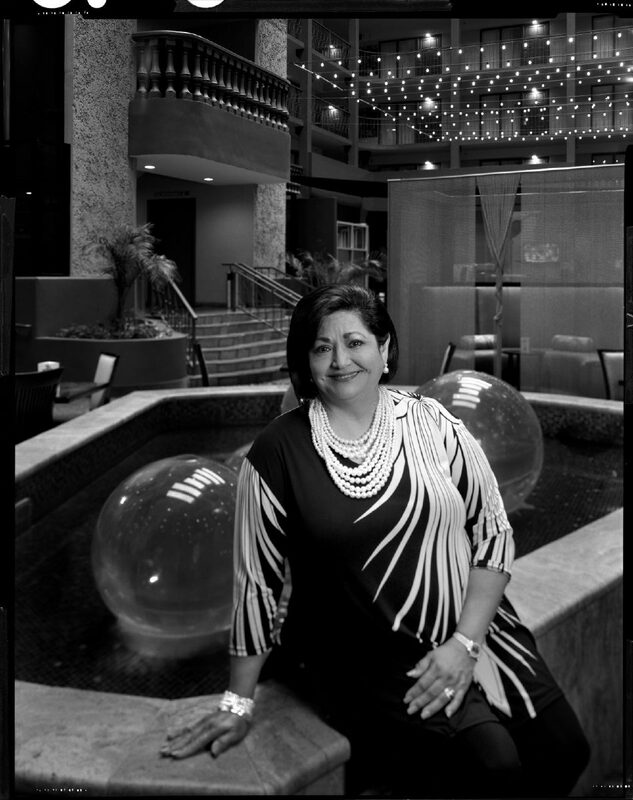 Cynthia Sakulenzki has been a fixture in business development for about 20 years at the Rio Grande Valley Hispanic Chamber of Commerce. A promoter of the Rio Grande Valley from local to international business, legislative agendas and philanthropic projects, Sakulenki keeps her calendar full working on bettering the future of the area. Sakulenzki is photographed in the atrium of the Double Tree Suites in McAllen. Tucked in the corner of her cluttered office, which she swears isn’t always that way, Cynthia Sakulenzki received a routine walk-in. “Is this the same as the Hispanic women’s network?” said a stranger who walked into Sakulenzki’s office on a recent afternoon. After answering several questions over a few minutes, the guest departed, and Sakulenzki smiled. Sakulenzki is the first and only Rio Grande Valley Hispanic Chamber of Commerce president, leading the organization since 1998. She has one assistant, but Sakulenzki has been the face and the cog of the chamber since its inception. The chamber seeks to promote economic development and assist businesses through networking and education. It’s a lot of work, Sakulenzki said. The amount of plaques and pictures needing to be hung on walls in her office while boxes of supplies and gifts stack on the floor are collateral for all the work the chamber does. “It’s all about networking,” Sakulenzki preaches. To encourage networking, there are regular conferences, seminars and workshops. Most common, though, are monthly mixers on the first Monday of every month. They’re hosted at varying locations, hoping to introduce more people to more places. And, of course, golf tournaments. All of this is done while working out of rented office space in a building on East Fern Avenue. But she predicts the chamber will have a building in less than 10 years, with satellite offices across the Valley. Sakulenzki wants the entire Valley to feel connected, and not just through Hispanic business — 20 percent of the chamber’s members are non-Hispanic. But while Sakulenzki tries to connect the Valley, she’s spent the last 20 years making her own connections. She has numbers of senators in her cell phone, ran into Al Pacino in Sacramento and Sylvester Stallone in New Orleans. But here in the Valley, it is not about the celebrities.